Trader Joe\'s Italian Tomato Starter Sauce and Pomi Chopped Tomatoes | GrubGirl. A few years ago when I actually attended a cooking school through HomeChef, the instructors strongly suggested that if you were going to cut corners in making pasta sauce, at least use the boxed stuff, like the Pomi Chopped Tomatoes, in place of chopping up tomatoes yourself. Any admittance of using a jar of tomato sauce or a can of chopped tomatoes was looked down upon as the ultimate cop out and sacrifice of taste and freshness. Why? Apparently the sweet and tangy taste of tomatoes is compromised by canning it in those tin things. Jars of sauce are guilty of having lots of sugar and water added to them. The only problem is that a box of the Pomi was too overly yuppie a purchase for a GrubGirl to justify. Only available at nicer grocery stores, and imported from Italy, prices ranged anywhere from $3.50 to over $5.00. Lo and behold, those few years ago, Trader Joe’s stocked the stuff and at a discount…$2-3 for a box. Yay! The most realistic sounding story I got from a store manager was that due to some crazy shenanigans with Pomi’s parent company Parmalat, TJ’s was no longer able to source the goods as their crazy low TJ prices. Hmmm. Sure, I’ll buy that. Well, here it is 2007 and I noticed something oddly familiar back on the shelves! No, it’s not Pomi Chopped Tomatoes, but a suspiciously similar box of Trader Joe’s labeled “Italian Tomato Starter Sauce” that includes, hm, chopped tomatoes! Fearing that this was a fluke, I swiped up 4 boxes. But fortunately, it’s been a few months and they still are on the shelves. And yes, the taste is refreshing and fabulous…and I will only return to the jar when I’m absolutely too tired to make anything from scratch. Trader Joe’s – please don’t discontinue this one! I just bought some of this Trader Joes starter sauce and was not sure how to prepare it. I want to make pasta sauce. What do I add to it so it comes out well. Is it really as everyone say it is? Where do I find it? I don’t ever recall seeing it in a Supermartket. @Joshua -Try a couple Trader Joe’s in your local neighborhood. (You can’t find it in other grocery stores). I always think that tomato sauces in these types of boxes are better tasting than the sauce in jars, which is still better tasting (to me) than the sauce in tin cans. Gasp!! Time for me to see if any are left to stockpile in SF. (Note: not all of the SF stores carried it.) Another (unproven) alternative is to buy the Pomi version in bulk via Amazon…but I don’t need TWELVE boxes of this stuff. I submitted a note on the TJ website and received the following response, I don’t believe it though. I just checked at one of the SF stores. Not on the shelf and a crew member looked it up online and said it had been discontinued. He said that even if it’s discontinued, they may find a few cases and provide it to some stores. I was also given no helpful recourse other than putting in a vote online. 🙁 I’ll do that. Apparently, I’m among many others who use the TJ Tomato Starter and love it. In some dishes like eggplant parmegan I use it instead of a regular tomato sauce because it doesn’t over power the taste of the eggplant. It is also perfect when preparing red clam sauce. I use only a little garlic, olive oil, tomato starter and the clams in their shells like in Italy and better restaurants in the USA. When I served this dish to friends, they said they had never had better and asked that I buy some for them also. Not possible. I was told at two TJs that it had been discontinued because it was not in great demand. I’ve been buying it for a couple of years and have not found that to be the case. Many times it was out of stock because of the demand and I had to request the store notify me when new stock was received. Because it was not always stocked is probably the primary reason that sales and demand may be low. If not available customers are forced to buy something else. However, nothing compares. TJs needs to know that discontinuing the Tomato Starter is a huge mistake. I did get the Pomi at our local Ralphs. It seems to be stocked at larger grocery stores. Sombody also told me that you can buy it at Amazon. The Pomi box is larger than the TJ Starter Sauce was. Taste is good and it works great. I like to use it as a base for Chioppino or any red pasta sauce. Last weekend at my TJ’s in SF, I got a different version from the person at the check-out stand (AND the bagger guy). They both nodded about the Starter Sauce, and said that it was indeed very popular in SF, and was no longer stocked. They alluded to “corporate”‘s analysis not taking into account the popularity of products in specific geographic markets. The product popularity was evaluated at an aggregate level. So if the major metros love it but other places don’t, they said it could still make the numbers look below average. I take all that as speculation but it sounds reasonable. I’m in. How do we get to corporate? I have a box in my hand right now and came here to find out how I might doctor it, and now I see that it’s been discontinued. I kind of feel like it’s gold and that I should hold it until the middle of the winter when I really need it. I found Pomi last night at Wal-Mart (in Vegas) of all places! Still expensive (I think it was $3.80 or so), but I was happy to see it. I haven’t been able to find them anywhere except on-line. Thanks for all of the posts on this! I was so bummed the last time I went to TJ’s and they told me they disco’d the Tomato Starter. I have a great Chicken Cacciatore recipe that I use it in. My neighbor had a few cartons of it and had given me my first one last winter, now I can’t get it anymore (Sacramento area). Had been passing the recipe along too…Found the Pomi at Whole Foods, but don’t like it as much either. Hit the link Grubgirl provided and posted a comment to TJ’s…hope it helps! Try finding Pomi chopped tomatoes at an Italian market if you have one nearby. In Montreal, they have the tomatoes at Milano Fruiterie on St. Laurent. They sell at $1.99 for 500 grams and $3.19 for 1000 grams. I also found the tomatoes at Price Chopper in Plattsburgh, NY for $2.39 a box for 26 ounces. I use them for chili and pasta sauce mostly. All my recipes start with garlic, onion and a box of chopped tomatoes. Use (ancho) chili powder, cumin and oregano for chili. Italian seasoning blend or fresh Italian herbs for a pasta sauce. I have done a Spanish inspired sauce with a bit of hot smoked paprika, thyme and olives. All very good imo. 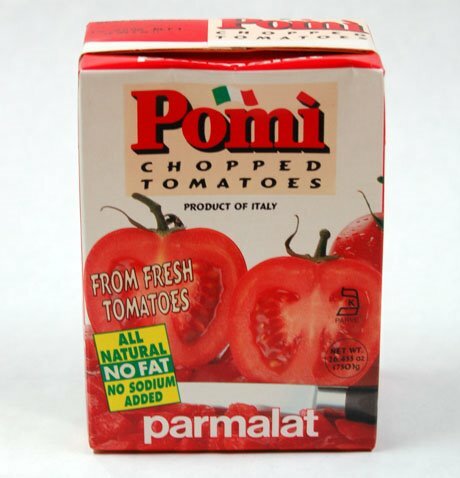 I ordered some from Amazon, but lately I’ve seen Pomi chopped tomatoes at my local Publix (9th and Spring St. in midtown ATL). If you have Publix, you may be able to get your local one to order them in. I stockpiled some Pomi chopped tomatoes and today, I noticed that it expired six months ago. Do you think it is still edible? @Keeka – I think that answer depends on your risk profile, which is a personal thing. Some people toss things right after that expiration date, others will give it a shot. Just weigh the money you paid for it versus the chances you could get sick times the # of days of lost productivity if you were doubled over in agony. Good luck. If I were you and found a stash of Pomi, I’d be facing the same dilemma! I ended up here googling Pomi which i’d never heard of. Looks like i’ve made a big score at the Big Lots! $1,and doesn’t even expire till Feb. These are the strained tomatoes. So don’t y’all forget about your grocery liquidators. Guess I’ll go back and get then the rest, based on your comments.